Product Code: 72PP003. Diecast Aviation Model. Aviation Models. 1:72 Scale Diecast Model. Ireland = £17.00. Fixed Undercarriage Down. Greece = £35.00. Portugal, Estonia, Latvia, Lithuania & Sweden = £30.00. Oxford Diecast 72HOR004 1:72 DH Sea Hornet F20 VZ-708 801 Sqn. HMS Implacable. Diecast Aviation Model. 1:72 Scale Diecast Model. Greece = £35.00. Portugal, Estonia, Latvia, Lithuania & Sweden = £30.00. Catalogue reference 72AA002. AVRO ANSON MK.I. 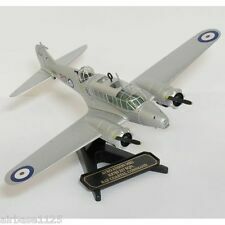 This is the year 2015 release of the 1/72nd scale Avro Anson as detailed above. RAF COASTAL COMMAND. However, it was rescued from obscurity by its suitability as a multi-engine air crew trainer, becoming the mainstay of the British Commonwealth Air Training Plan. By the end of production in 1952, the Anson spanned nine variants; a total of 8,138 were built in Britain by Avro. NEW IN BOX. Spain, Italy, Austria, Switzerland, Portugal, Luxembourg, Slovakia and Czech Republic, £18.00 up to 20kg. Mosquito FB.VI Black Rufe, Sqn. Robert Kipp, No. 418 Sqn., RCAF. MACROBERTSON AIR RACE MY HILDERGARDE-72PM007. The Puss Moth was a three seater high wing aircraft designed and built by De Havilland between 1929 and 1933. It was one of the first British monoplanes to be built and took its first flight in 1929, coming into general service a year later. NIEMCY 1945 AC084. OXFORD AVIATION. AD006 DH4 202 SQUADRON RFC 1918. OXFORD AVIATION. DAVIDH6876 (DAVES DIE-CAST MODELS). D.H.82 TIGER MOTH FLOATPLANE L-5894. OXFORD AVIATION. ROYAL AIR FORCE-72TM010. The Junkers Ju 87 or Stuka (from Sturzkampfflugzeug, "dive bomber") was a two-man (pilot and rear gunner) German dive bomber and ground-attack aircraft. Designed by Hermann Pohlmann, the Stuka first flew in 1935 and made its combat debut in 1936 as part of theLuftwaffe's Condor Legion during the Spanish Civil War. 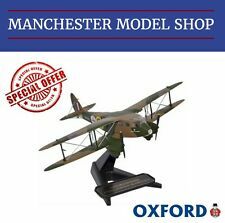 Oxford Modelzone Exclusive Models. Supermarine Spitfire. Spitfire as flown by Sgt R Havercroft, no92 Sqn ,1940. 1:72 Scale. We will always find the cheapest quote based on the weight of your item. made with love by. The Flying Tigers were divided into three pursuit squadrons, the Adam and Eve; Panda Bears; and Hells Angels. Robert Neale was the top flying ace with the AVG, amassing 13 victories. He was awarded the British DSC for his exploits in the defence of Burma. Product Code:AC084. Modern Trucks. Portugal, Estonia, Latvia, Lithuania & Sweden = £30.00. Denmark, Spain, Austria, Czech Republic, Finland, Hungary, Norway, Poland, San Marino, Slovenia, Slovakia & Switzerland = £25.00. Several are preserved across the world and our version is modelled on the aircraft on display at the RAF Museum, Hendon, a replica of the Mk III 425 hp version. Coloured triangles, also in yellow, feature on the lower wings and on the sides of the fuselage. Model depicts an aircraft of 718 Sqn, FAA, 1945.